Taliban militants have reportedly laid siege to a school in Pakistan, killing more than 130 children. This is an horrific event, but one which is suspiciously convenient for the Obama administration because it diverts public attention from the uproar over recent killings of Americans by police and gruesome CIA torture revelations, and provides justification for continued US military activities there. Indeed, the American Caesar was quick to comment on this event though he often ignores similar events of equal weight. 1. Pallas square Jupiter and semisquare Pluto. 2. 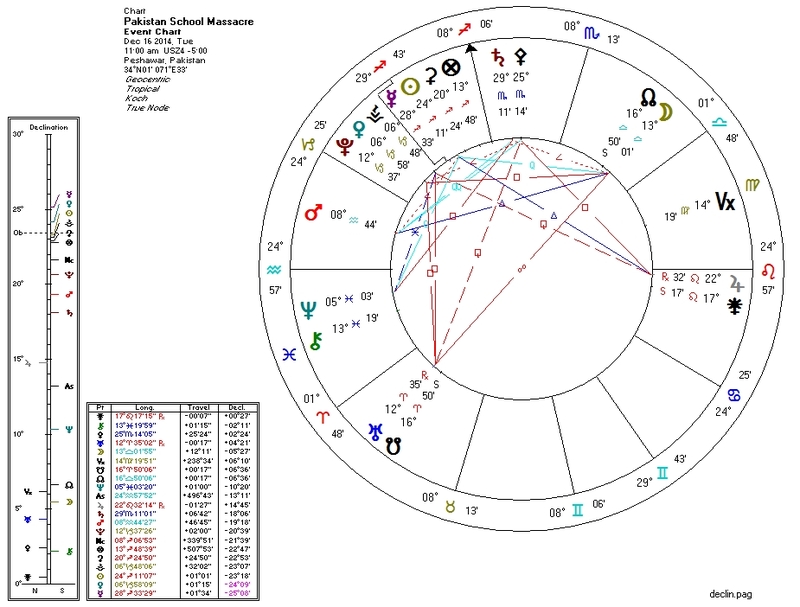 Venus sextile Neptune; South Node in the Second House; Saturn, ruling Venus, square Neptune; Mars, ruling the Second House, in the Twelfth House. 5. Sun in wide stellium with Pluto and at the Pluto-MC midpoint. Some of these aspects are getting stronger. I think there's a high likelihood of more violence this week. The Uranus-Pluto square becoming exact probably doesn't help things either.